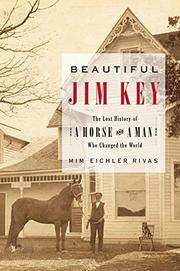 Charming tale of a forgotten American celebrity: Beautiful Jim Key, the amazingly intelligent horse. At the turn of the century, the four-footed superstar was touring the country, giving exhibitions of his astounding mental acuity and wooing the ladies with his Tennessee charm. State fairs, agricultural exhibitions, even the Broadway stage: Jim Key graced them all, giving demonstrations of his abilities to spell, do arithmetic, act, and fetch a silver dollar from the bottom of a clear glass bucket full of water. Countless reporters tried to debunk the horse’s extraordinary talents, but none succeeded. His owner, the self-taught veterinarian Dr. William Key, would even allow the horse to be interviewed when the Doc was out of the room; Jim always came up with answers. Doc Key was a character in his own right, a freed slave with a fascinating history, and ghostwriter/coauthor Rivas (in her first solo effort) brings her two protagonists vividly to life: the disappointingly spindly colt and the man with a will of iron, and patience to match, make a compelling pair. The story of Doc and Jim Key expands to encompass the political and social character of Tennessee, the Civil War—Doc spent much of it protecting the two sons of his master, who’d enlisted with the Rebels—race relations, the quality of American entertainment, and the fledgling humane-society movement (Doc Key consented to Jim’s touring schedule in part to bring awareness to the cause of kindness to animals, a tough sell in a time when not even kindness to humans was formalized through any government agency). Rivas conjures up convincing scenes of a world gone by, and, though the telling lags a bit in the middle, Doc and Jim are so likable, and tragedy so assured (all horses must die), that the reader sticks around. Just might be the bottled lightning that was Hillenbrand’s Seabiscuit.